I have absolutely no idea how this week's Free GM Resource has evaded me for almost a decade. I wish I knew about this last month so I could have put it up as a Christmas Present of OSR goodness for my fellow uninitiated gamers. Basic Fantasy Role-Playing Game has been around since 2006 and is currently on the 3rd revision. You can pretty much download "everything" for free or pay to get high-quality prints at Lulu.com or CreateSpace.com. "The Basic Fantasy Role-Playing Game is a rules-light game system modeled on the classic RPG rules of the early 1980's. Though based loosely on the d20 SRD v3.5, Basic Fantasy RPG has been written largely from scratch to replicate the look, feel, and mechanics of the early RPG game systems. It is suitable for those who are fans of "old-school" game mechanics. Basic Fantasy RPG is simple enough for children in perhaps second or third grade to play, yet still has enough depth for adults as well. 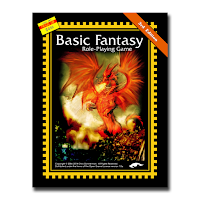 Basic Fantasy RPG is an Open Source game system, supported by dedicated fans worldwide who have contributed hundreds of pages of rules supplements, adventure modules, and other useful and enjoyable game materials as seen on our downloads page. We'd love for you to join us on our forum where we discuss the game as well as creating new materials for it."